Ethernet vs. MPLS vs. Dark Fiber: Which is best for your business? Network infrastructure is critical to your business operations because it enables connectivity across your enterprise and to the world. But with all the deployment options available—like TDM, MPLS, and Ethernet Private Line—which one is best for you? 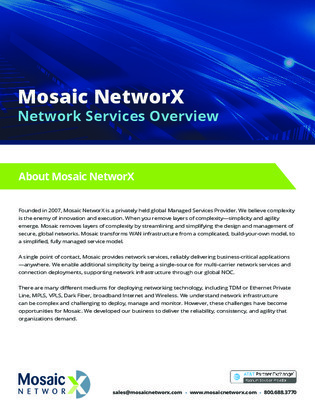 Download this white paper for an overview of Mosaic Networx’s available network services, and their features.